How Should I Store My Vintage Postcards? 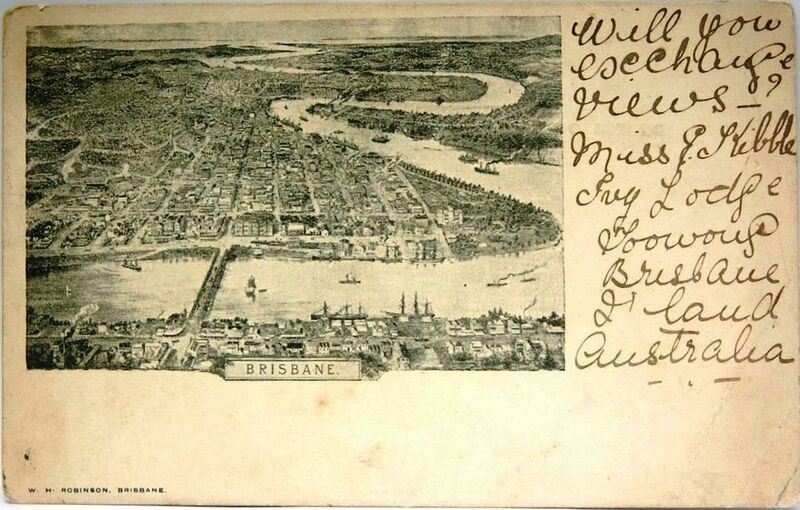 Vintage postcard of Brisbane - 1904. For collectibles more than 100 years old, postcards produced in the early 1900s can often be found in remarkably good condition. Many of these cards were collected and stored in albums when they were new, and this helped to preserve the vivid printing and paper through the decades. This is true even if those albums eventually made their way into attics, garages, and other environments usually unfriendly to ephemera. As the albums themselves deteriorated over time, the cards were often removed by family members, antique dealers, or collectors who ended up with them. Improper care and storage going forward sometimes lead to stains, tears, rubs, bent corners, and other condition issues that can diminish value. To avoid further damage to a collection of old cards, there are a number of excellent storage and display methods to consider including new albums, archival boxes, and framing. The advantage of storing cards in a new album comes with the ease of perusing your collection without touching the cards. This helps to keep them clean and deters further damage that can happen when they are handled frequently. A postcard album consists of a binder and clear plastic inserts that fit inside, with each insert having multiple slots to hold the cards. Even more important than the binder itself, since it won't actually be touching the paper, are the inserts that hold the cards. It is important to make sure the inserts you use are archival quality. Archival quality basically means the materials will not only protect the cards from wear and tear damage, but will not harm them by emitting chemicals. Be certain the clear inserts you purchase are made of PVC-free plastic to avoid this concern. Take some time to organize the cards logically before slipping them in the slots. This will help you to avoid removing them and reinserting them over and over again. Each time you remove and reinsert a card, you risk a bend or tear. As with storing old photographs, storage boxes are particularly handy when dealing with large quantities of cards. A plus to using boxes to store postcards is the ease this method offers in indexing and sorting the cards by subject matter or type. They can also be labeled on the outside of the box so you know what is inside, and stacked for easy storage. Again, archival quality is important when purchasing storage boxes. This is especially true if the cards will actually be touching the sides or bottom of the box with no further protection. Cardboard boxes should be acid-free, and some experts suggest using aluminum boxes instead of cardboard. Using individual Mylar (or another type of PVC-free plastic) sleeves to hold each postcard is preferable no matter what type of box is used. Mylar sleeves allow you to handle the cards without actually touching the paper. This keeps oils and acids from your fingers from transferring to the paper while protecting them from other perils such as soiling and tears. You can also wear gloves to mitigate this type of damage, especially when handling particularly valuable examples. If you have a small collection of special cards, framing them to display on shelves or walls is an option. This way you can admire them, share them with others, and protect them at the same time. The recurring theme of using archival quality materials comes into play here as well. Whether you frame the cards yourself or have a professional framer do the work, make sure acid free papers and mats are used. It's best if the card itself does not touch the glass, and an acid-free mat usually works well for this purpose. The mat can be cut to fit a standard size frame for economy but be sure all materials actually touching the card are acid free. When your framed project is complete, hang it away from direct sunlight to avoid fading. Displaying collectibles in a hallway without windows or a room that stays dark or dimly lit most of the time is preferable. Albums and sleeves specially made for postcards can be purchased from a number of online retailers including the2buds.com. You can shop around for the best deals on your supplies, and even buy them locally from a craft or hobby store. But, once again, be sure you're using archival quality products to preserve and protect your postcard collection. Framing supplies and services are available at most local craft stores and frame shops. If you're not sure what you need to safely frame your postcards, consult with the framing department in one of these stores for more guidance.